Abstract: The dinosaur footprints have been discovered on the island of Veli Brijun, Croatia at one Late Barremian site (Pogledalo) and three Late Albian sites (Ploce, Kamik/Pljesivac, Trstike/Debela Glava). The Late Barremian ichnocoenosis contains tracks of large theropods in intertidal sediment. The footprints assigned to the large ‘carnosaur’-type theropods predominate over a rare gracile form. Footprints of small to medium sized theropods, medium sized ornithopods and small ornithopods are present in Late Albian ichnocoenosis as well as possible chelonian footprints. They were formed in a lagoonal environment that was occasionally subaerially exposed. The parallel trackways could indicate gregarious behaviour among the small ornithopods. Footprints of an iguanodontid ornithopod represent the only such findings in the Istria. The speeds of individuals at all four localities indicate normal walk. A total of 145 dinosaur footprints and 75 possible chelonian prints have been mapped; 111 prints are arranged in 14 trackways. 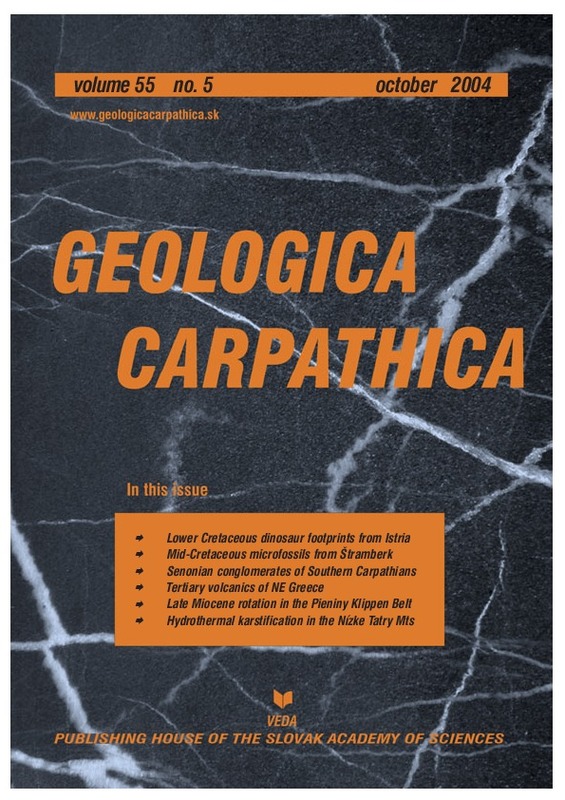 Abstract: Microbiostratigraphic study of sporomorphs, dinoflagellate cysts, foraminifers and calcareous nannofossils documented the age and paleoenvironmental features of black and grey-green, organic-rich sediments in the classical area of Stramberk (Baska Formation, Silesian Unit, Outer Western Carpathians). Age-assessments suggest Late Albian and Cenomanian age (foraminiferal Zones Rotalipora appenninica, R. reicheli and R. cushmani; nannoplankton Zones BC27/UC0-UC4). The character of dinoflagellate cyst assemblages (e.g. presence Pterodinium) reflects open-sea environment. The presence of calcareous foraminifers and nannofossils gives an evidence of depositional conditions above the carbonate compensation depth (CCD). The presence of some terrestrial and non-marine aquatic palynomorphs (e.g. Tetraporina, Lecaniella) documents the proximity of a continent and fluvio-lacustrine influences. The presence of microfossils tolerating low-oxygen bottom conditions such as foraminifers of genus Lingulogavelinella and jaws of polychateous annelids (scolecodonts) reflect a dysaerobic bottom environment. Co-occurrence of Boreal and Tethyan species encountered in foraminiferal and palynomorph assemblages documents the influences from the higher latitudes on the depositional area of northern Tethys. Moreover, Lower-?Middle Cenomanian sporomorphs (angiosperms) have similar character to others of the same age from the Blansko Graben, in the SE part of the Bohemian Cretaceous Basin, which is situated on the SE border of the West European plate. Abstract: The Southern Carpathians (Romania) represent a segment of the Alpine belt of Europe where Cretaceous collision generating nappe stacking was followed by normal faulting leading to core complex formation and exhumation of the lower (Danubian) nappe system, in a process of orogen-parallel extension. There is a controversy on the timing of the normal faulting: latest Cretaceous versus Eocene. One of the reasons for the Cretaceous option rests on the consideration of the basement of the Danubian nappes from the Retezat Mountains as the source area for granite and gneiss pebbles in Upper Maastrichtian-Paleogene(?) red conglomerates of the Haţeg Basin. Zircon fission-track ages around 80 Ma of granitic pebbles from these red conglomerates have been previously used to date the start of the exhumation and erosion of Danubian nappes since the Late Cretaceous, assuming their provenance from the southerly located Retezat pluton. But the major and trace element composition of a granite pebble, from the same outcrop at Clopotiva, shows K, Na, Rb and Th excess and Ca, Fe and Sr deficit, precluding its origin from this major Danubian granitoid pluton. This leaves room for an Eocene to Early Oligocene start for the exhumation of the Danubian nappes. Abstract: The Tertiary Evros volcanic rocks (EVR) crop out in northeastern Greece (Thrace), in close association with fault-controlled sedimentary basins, formed in an extensional regime. Three volcanic areas, called the Loutros-Feres-Dadia, Kirki-Esimi and Mesti-Petrota after the corresponding basins, could be distinguished. The rock bulk chemistry shows features of calc-alkaline to high-K calc-alkaline and, locally, shoshonitic rock series. Compositional variations indicate magmatism of convergent margins. The EVR form lava flows, domes, dykes and abundant pyroclastics. Their chemical composition ranges from basaltic andesite to rhyolite through andesite, trachyandesite, trachydacite and dacite. The basaltic andesites are two-pyroxene rocks, while the andesites are either pyroxene andesites or biotite-hornblende andesites. The trachyandesites and trachydacites have pyroxenes and biotite. The dacites mostly have biotite and hornblende and locally pyroxene. Rhyolites have mainly biotite and rarely hornblende. All the rocks are porphyritic with glassy, holocrystalline or semicrystalline textures. The K/Ar ages range from 33.4 to 19.5 Ma, establishing an Oligocene (33.4–25.4 Ma) and an Early Miocene (22.0–19.5 Ma) volcanic activity. Intercalations, however, of pyroclastic materials with Priabonian clastic sediments indicate that the volcanic activity started earlier than the Oligocene. Two main groups of rocks have been distinguished, the PxBt group comprising basaltic andesite, pyroxene andesites, trachyandesites and trachydacites, and the HblBt group comprising hornblende-biotite andesite, dacite and rhyolite. On the basis of the rock chemistry two parallel, sub-parallel or cross-cutting geochemical trends are distinguished, indicating different evolutionary histories for them. The Sr isotopic composition differs in the two groups, with Sr I.R. ranging between 0.7057 and 0.7074 in the PxBt group, and between 0.7071 and 0.7080 in the HblBt group. The PxBt group was evolved through an open system process (MFC — mixing plus fractional crystallization) in which basaltic andesite and trachydacite represent the basic and the acid end-members respectively. Although assimilation plus fractional crystallization is not excluded, MFC between a basic end-member, similar to the HblBt andesites, and an acid end-member, having rhyolitic composition, is suggested as a possible process for the evolution of the HblBt group. The parental magmas for the evolution of the PxBt group originate in an inhomogeneous and strongly metasomatized mantle through a slight modification of a primary basaltic melt. The parental magma for the evolution of the HblBt group could be a hybrid magma of the PxBt group, which evolves, under different conditions, to give the HblBt group rocks. Although the involvement of a mantle component cannot be excluded for the origin of the rhyolitic melts, partial melting of crustal material (amphibolite, basalt, andesite, gneisses, pelites, greywackes), under various P-T conditions, are responsible for the genesis of melts similar to the less evolved rhyolites. Abstract: The Pieniny andesite line is a 20 km long zone, which cuts obliquely the contact between the Pieniny Klippen Belt which separates the Inner and Outer Western Carpathians and the Magura Nappe (the innermost nappe system of the Outer Western Carpathians). The andesites (dykes and sills) were formed during two intrusion phases. The older dykes are subparallel to the andesite line, while the younger ones are perpendicular to it. Formerly, the andesites were thought to be of Sarmatian age, recently obtained K/Ar ages are in the 10.8–13.5 Ma range. For paleomagnetic study, we drilled macroscopically fresh material from both generations of the andesites. The samples were subjected to detailed alternating field and thermal demagnetization. Isothermal remanence acquisition experiments, Curie-point measurements and microscopy analysis of polished sections were carried out in order to identify magnetic minerals. The results are as follows. The second phase andesites and some sites in the first phase andesites have complex natural remanent magnetizations (NRM) with two stable components: one is isolated below, and the other above the Curie-point of magnetite. It is remarkable that thermal demagnetization was often needed to reveal all components of the NRM although the rocks we studied were Neogene igneous rocks which are considered ideal targets for the less time-consuming alternating field method. The lower temperature component follows a great circle containing the expected stable European direction of corresponding age. The higher temperature component has counterclockwise rotated declination. The remaining sites of the first phase andesites have practically a single component remanence, which corresponds to one or the other of the directions described above. The components with counterclockwise rotated declinations cluster around an overall-mean direction of D=133°, I=–56° with k=26, α95=12° (based on 7 site-mean paleomagnetic directions). Neither the magnetic minerals, nor their degree and type of alteration are different in the two generations of andesites. Thus, the agents of remagnetization were probably hot fluids acting after the emplacement of the second generation dykes. The tectonic implication of our results is that the Pieniny andesite area must have rotated counterclockwise, after emplacement of the second phase dykes. Abstract: Hydrothermal paleokarst cavities with calcite crystals up to 20 cm in diameter were found in two caves of the Nizke Tatry Mountains developed in Triassic limestone and dolomite of the Guttenstein type. In both caves, older zones of tectonic and hydrothermal activity have been overprinted by vadose speleogenesis. According to fluid inclusion microthermometry data, prismatic-scalenohedral calcite from the Silvosova Diera Cave has precipitated at temperatures between ~60 and 101 °C from low salinity aqueous solutions (≤0.7 wt. % NaCl eq.). Carbon and oxygen isotope profiling revealed significant δ13C decrease accompanied by slight δ18O increase during growth of calcite crystals. The negatively correlated carbon and oxygen isotope data cannot be interpreted in terms of any geologically reasonable models based on equilibrium isotopic fractionation. Fluid inclusion water exhibits minor decrease of δD values from crystal core (–31 ‰ SMOW) to rim (–41 ‰ SMOW). Scalenohedral calcite from the Nova Stanisovska Cave has precipitated at slightly higher temperatures (63–107 °C) from aqueous solutions with salinity ≤2.7 % NaCl eq. The positively correlated trend of δ13C and δ18O values is similar to common hydrothermal carbonates. The fluid inclusion water δD values differ significantly between the crystal core (–50 ‰ SMOW) and rim (–11 ‰ SMOW). The calcite crystals are interpreted as representing a product of an extinct hydrothermal system, which was gradually replaced by shallow circulation of meteoric water. Fossil hydrothermal fluids discharged along Alpine uplift-related NNW–SSE-trending faults in Paleogene–pre-Pliocene times. Increased deuterium concentration in the inclusion water compared to recent meteoric precipitation indicates a warmer climate during the calcite crystallization.